My friend Teresa recently posted a Utne Reader article (http://www.utne.com/Arts-Culture/Rewriting-History-With-a-Wink.aspx) on her Facebook page and I was struck by the sign that announced the demise of yet another small business due to introduction of one of the large, monopolistic, box stores. This reminded me of this photo I took a couple of years ago in Ann Arbor, Michigan. I took the shot, while sitting at a traffic light (you can see taillights in the far right window). I took it because it reminded me of my father’s TV repair business, which he owned for over three decades. He was not driven out of business because a larger business came in and offered services at a cheaper price rather, he simply could not compete with the throwaway sets that flooded the market. The box stores, and our voracious appetite for newer and bigger things, did their part in closing his business. 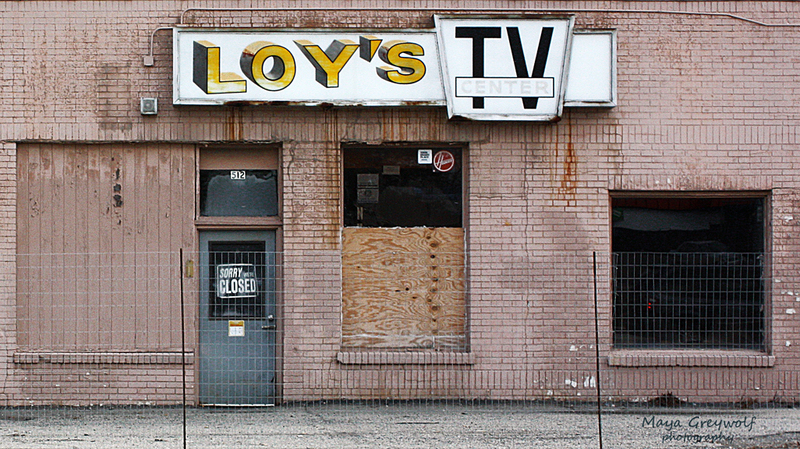 Loy’s TV was torn down about a month after this photo was taken, to make room for a grocery store parking lot. The photo is grainy and desaturated for effect. Maya’s Musing – It truly is difficult to find products made in America these days but they are out there. I encourage you to support your local businesses and buy products grown, made and serviced in America when you can – even if it takes a little research to find them or, it costs a little extra money. Did you know that the plastic spoons, knives, and forks that you buy at the grocery store are made in China?